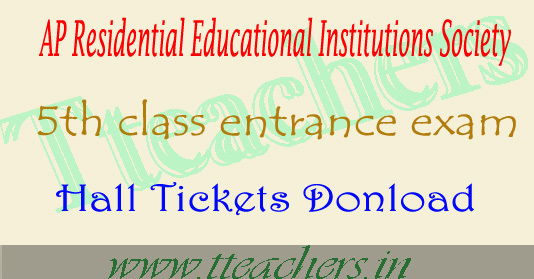 AP residential school hall tickets 2018 5th class admission test : Download the APRS 5th class entrance exam hall ticket 2018 from 26th February 2018 for the admission test to get admission in Andhra Pradesh residential schools in the state. The Andhra Pradesh Residential Educational Institutions Society APREIS are going to organize this APRS 5th class entrance test 2018 on 5th March 2018. So based on the notification, those who have applied for the 5th class admission test can download AP residential school hall tickets 2018 using their reference number. Those details of APRS 5th class admission test hall tickets 2017 are given briefly in the following section. Secondly, you can only get the AP residential school 5th entrance exam hall tickets 2018 through online and no printed / duplicated APRS 5th hall ticket 2018 download will be issued. A huge number of candidates who are looking for the admissions into 5th class in Residential schools have applied for the APRS 5th class entrance examination. Candidates who had applied are searching for the AP residential school hall tickets 2018 as it is the crucial document to carry for the pre allotted exam centers and contains details regarding exam venue, roll number etc. The conducting authority APREIS will release the results for 5th class entrance exam 2018 appeared candidates as per schedule.After announcement of APRS 5th class entrance exam result, candidate can access the link provided by APRS 5th class entrance exam 2018 authorities on official website. Select the link given regarding APRS 5th class entrance exam hall ticket 2018. 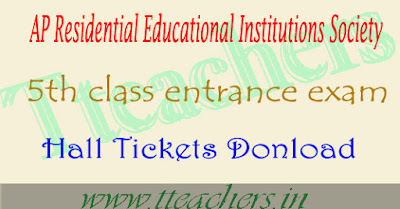 Take a printout of the same and carry AP residential school 5th class hall tickets 2018 to the exam center.